You HAVE to try this dish! I can't believe that I haven't posted it sooner. I have no idea how I let it slip under the radar. Doesn't matter because I am correcting the horrific error of my ways! I cannot possibly fully describe how delicious this dish is, but I am going to try. Even if you're tempted, do NOT change or substitute any of the ingredients. The combination may look odd, but it is an amazing melding of many great flavors into one perfect dish—meaty, saucy, full-bodied, flavorful. I could go on and on, but I won't. This one is a little bit of a splurge dish because it's a little of extra work, and it has a couple of unusual items that are a little more expensive and hard to find, but it's worth every second and every penny. If you try it, be sure to leave a comment and tell me what you think! And if you truly enjoyed the dish, than read about it's creator at the bottom of the page in the Credits section! Each number is a separate process with a separate bowl. Chop salt pork into small pieces (no larger than a dime). Chop chicken into small bite-size pieces (no larger than a quarter). Add a little olive oil, then salt and pepper the chicken and mix thoroughly with your hands. Mince finely the garlic, basil, and sage; combine together with red pepper flakes in a bowl and let sit. Slice tomatoes in half lengthwise (if mini San Marzanos) or in quarters (if Campari); basically roughly bite-sized pieces. Add anchovy paste and water and mix together; let sit. Cook the rice in a saucepan or rice cooker. Heat the butter in a stainless steel pan (NO NON-STICK HERE!) on medium-low heat until melted. Add salt pork and cook on medium heat for 4 minutes, until cooked about halfway through. Turn heat to medium/medium-high and continue to cook for 1 minute, until oil is hot. Add seasoned chicken in a single layer. Cook for 2-3 minutes without touching the chicken/pork (very important). Then stir the chicken/pork around in the oil, then cook for for another 3-4 minutes without touching it. Leaving the pork fat/butter in the pan, remove the chicken/pork to a plate. Turn the heat down to low/medium-low. Add garlic/herbs/pepper mixture to pan in a single layer. Let sit in oil for 4 minutes, stirring occasionally. You don't want to saute the mixture, especially not the garlic. It needs to be heated through to flavor the oil, but not cooked. Add the tomato/anchovy mixture to the pan, and turn heat up to medium-low. Cover pan and cook for 15 minutes, stirring occasionally and mashing the tomatoes. Sauce should simmer after a few minutes. Mix in chicken/pork and rice, and heat through for 1-2 minutes. Season to taste with salt and pepper. *Adjust the amount of red pepper flakes to determine the level of spiciness of the dish. A touch less for less spice or some extra teaspoons for some heat! **If you cannot find fresh San Marzano tomatoes, then I recommend the very large can of whole San Marzano tomatoes. Chop the canned tomatoes up, reserving the juice. In step 4 of the Prep, add the chopped tomatoes and reserved juice and skip the water. If you cannot locate canned San Marzano tomatoes, then I would recommend fresh Campari tomatoes as the next substitute. I recommend in this order because San Marzano tomatoes are some of the best tasting tomatoes I have ever enjoyed. Even the canned tomatoes remind me of my summer in Italy, and that's a hard taste to match! ***I prefer Arborio for Italian-type dishes, but I've also used Asian rices in this recipe with great results. The regular white rice at most groceries, I don't really recommend because the texture isn't as great. You want a nice sticky rice as they hold up better to sauces and longer cooking times. 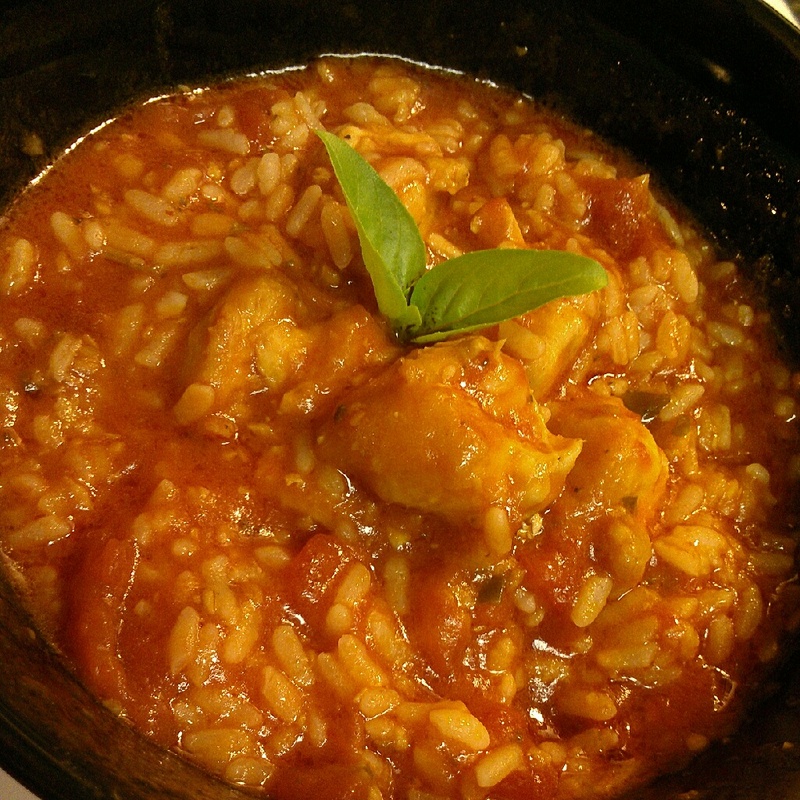 Arborio or Asian rices will work much better in this recipe, in my opinion. A very special thanks to my brother's good friend Ozzie for the recipe and permission to share. While I wish the recipe was mine, I have to give credit where credit is due. The dish is fantastic, and should be in every recipe book! And another thanks to my brother, Kyle, for providing the first recipe suggestion! Also, I have to say thank you for typing it up and providing such an easy and readable format to keep everything in order. And lastly, thanks to my dad for donating a few of the more expensive ingredients to make this dish happen so that it would be posted to the blog. I refuse to post any recipe until I've actually made the dish and tried it, so I couldn't have done it without his help!